The California Trail led thousands of prospectors to the California Gold Rush. Though they aren't totally sure how long the trail was, they estimate it to be around 2,000 miles. It ran from some of the same jump off points as the Oregon trail. People headed to California even before gold was discovered there in 1848. Over 250,000 gold-seekers and farmers passed through Missouri, Iowa, Kansas, Nebraska, Wyoming, Idaho, Utah and Nevada. In just 1849-1850, it is estimated that 70,000 emigrants traveled on the trail! Gold was discovered in 1848. Before that, however, travellers were already on their way to California, through what is now Missouri, Iowa, Kansas, Nebraska, Wyoming, Idaho, Utah, and Nevada. Before the trail was blazed, the region has only partially explored because the territory had belonged to the Spanish until the end of the war. That changed in 1832...Benjamin Bonneville, an army officer, requested leave of absence to start an expedition west. While Bonneville was exploring the Snake River in Wyoming, he sent some men under Joseph Walker to explore the Great Salt Lake (in Utah) and find an overland route to California. In the 1840's, settlers began using the trail. 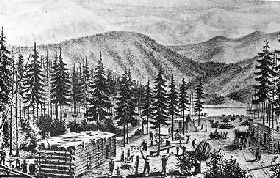 One of those settlers was John Bidwell who led a party in 1841 on the Humboldt River Route. One man, Joseph Chiles, in that party lead another expedition party to California in 1843 and opened more segments of the California trail. As people traveled this trail, more short cuts were found. Some of these short cuts caused problems and would lead to the death of many travelers (like the people in the Donner Party). Early emigrants called the California Trail an "elephant," because the journey was incredibly difficult. The greatest challenge was often crossing through the Rockies (like Lewis and Clark!) 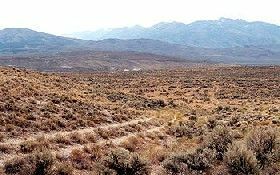 but unlike those who came on the Oregon Trail, these emigrants had to also face the barren deserts of Nevada and the Sierra Nevada mountain range. People who said they'd, "seen the elephant," it meant that you'd seen some hardships on your journey. Eventually, the railroad came and replaced parts of the trail. In time, automobiles came and highways were built, replacing the trail completely (highway 40 and 80 in California follow the trail still! ).